Radio-controlled flying drones are commonplace today - so much so that the Federal Aviation Administration (FAA) has enacted legislation to strictly limit who can fly them, where they can be flown, how big they can be, what type of payloads can be carried, how far from the pilot they can be flown, etc. - the typical kind of overreaching and overregulating that governments promulgate (especially in the last few years). Sport model airplane flying has suffered loss of freedoms because of it by getting lumped in with multirotor drones. 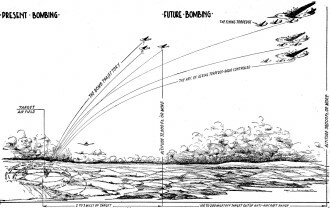 A comparison of present-day short-trajectory bombing methods with future bombing, using long-range radio-controlled aerial torpedoes. One of the most startling possibilities in future air warfare appears to be the development of radio-controlled robot airplanes that can accompany heavy, long-range bombers to their distant objectives. Large bombers, despite their numerous gun stations and heavy armament, are always vulnerable to numerically superior and faster enemy fighter aircraft because they are of themselves slower and more cumbersome. Fighter aircraft cannot accompany them on distant missions because their normal fuel capacity is limited. As part of the bomb load, these huge flying fortresses could each carry a number of tiny radio-controlled planes. 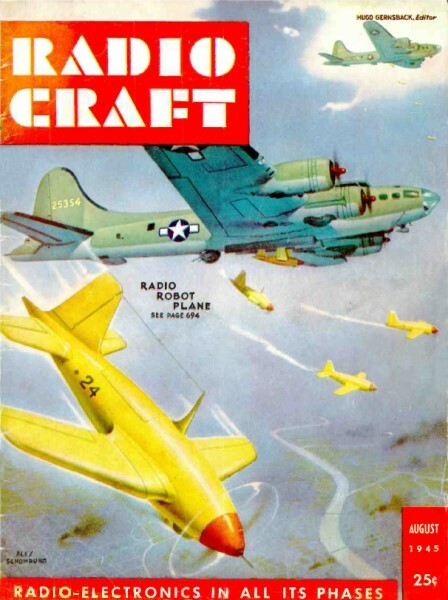 These miniature planes would have folding wings so that they could be stowed away in the fuselage of the larger mother ship, the robot planes being staggered to fit the least possible interference into the faired-away interior. They would have small and inexpensive engines of the required output, fed from fuel tanks of rather small capacity, since their radius and duration of action would be intentionally limited. They will carry a gyro pilot, controlled by robot mechanism set by radio impulses transmitted from the mother plane, as well as several bombs and smoke-screen gas tanks. The bombs could be detonated by radio. In no branch of aerial warfare has there been any weapon exhibiting the versatile possibilities that these radio robot planes incorporate. They could be hung upon special hooks within the fuselage and the crew could lower them through the fuselage doors, open and lock the wings, start the engine, check the radio control, and release them for free but controlled flight within the visual range of the radio control operators. Carrying their timeable bomb load, they could be directed into formations of enemy aircraft to create havoc among them, and divert and prevent attacks upon the bombers themselves. They could be sent into enemy ground objectives with more accuracy and with less danger to the bombers than any precision-aimed free bomb drops. They could precede or surround the bombers they protect, sometimes emitting smoke screens to confuse the enemy aircraft. 1 - High explosive charge. 2 - Detonator and fuse. 4 - Radio control space. 5 - High-powered gas engine. Since they could not be retrieved, and their object would always be to destroy themselves with their deadly cargo, it is apparent that they could be constructed of nondurable materials. Being small and light, they could be produced in huge quantities at comparatively low cost. They would represent an enormous "suicide squad," but one which would not risk a single life of the operating forces. While they could be adapted equally well to protect shipping when operated from surface vessels, their greatest all-round use would be as bomber-based flying bombs. This particular radio-controlled bomb would have several unique features differentiating it sharply from long-range robot planes controlled by set mechanisms, such as the V-1 type used by the Nazis against England. The latter must have sufficient instruments to detect, correct and compensate for variations in air density, winds and course changes caused by exploding anti-aircraft shells. 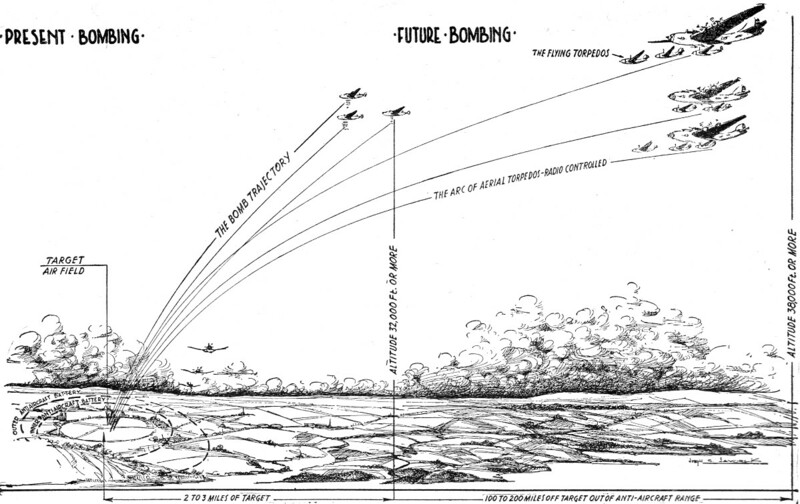 Being controlled within the limits of visual range from mother aircraft (these limits may extend up to a hundred miles under good weather conditions if observed through high-powered glasses and if equipped with smoke trail apparatus), the flying bomb is not a robot in the sense of those that are launched with preset controls. If anything, it becomes more of a precision bomb than those which are dropped in free flight and over which no further control can be exercised. The constructional possibilities are disclosed in the accompanying illustration. Essentially, this radio-controlled bomb could be made in three sections which could be nested into each other for final assembly. 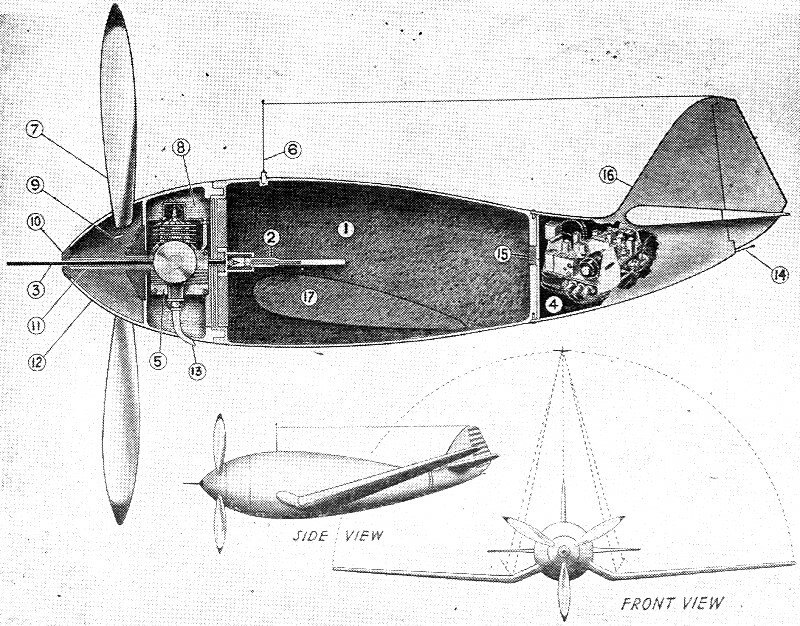 The forward section or nose would contain the small compression-ignition engine, together with fuel tanks and propeller. Due to their short-range action, fuel tanks would be relatively small. The center section would be the actual bomb containing the explosive, which could be detonated either through the firing pin extending through the forward power section, past the propeller spinner, or by means of radio through a detonator operated from the rear section. 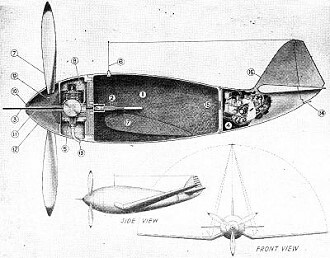 The rear section would carry the radio receiver connected directly to the tail surface controls. Connecting rods, cables and wires therefore would be direct and short. The wings would set into special recesses and hooks on the center section. While controllable bombs of this type would cost more than free-drop bombs of similar weight, they might in all likelihood reduce heavy bomber losses because the latter could remain well away from the target area in any direction. Excerpt from "Aircraft Armament," published by Aerosphere Inc., N. Y. C.